Our speaker for the December meeting was the radio astronomer Dr Ben Stappers from Manchester University who came to talk about one of the projects he is involved in called LOFAR (Low Frequency Array for radio astronomy). When completed this will effectively be the largest connected radio telescope, using the technique of combining multiple individual antennae known as interferometry. As a general rule the larger the diameter of a telescope then the higher its resolution. This is true for both optical and other telescopes that collect different wavelengths of electromagnetic radiation of which visible light is only a tiny fraction. It is too expensive and impractical to build telescopes with larger and larger diameters, so astronomers use interferometry which takes signals from single radio telescopes spread across the Earth's surface and then summing the signals to produce a radio image of an object. LOFAR essentially consists of thousands of small radio antennae grouped into 48 stations. 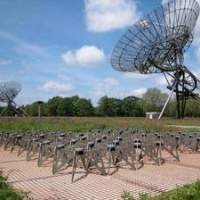 The project is funded by the Dutch government and being built by ASTRON, which is a Netherlands astronomical foundation and is operated by their radio observatory. Most of the stations are being built in the Netherlands (40) but there will be 5 in Germany and one each in the UK, France and Sweden. All the data they gather are digitised and sent to the University of Groningen where they are processed by a supercomputer. The UK site is based at Chilbolton and you can take a video tour of the site by going to the LOFAR-UK website at www.lofar-uk.org. Unfortunately, the site has suffered some damage in the recent storms that have swept the UK with wind speeds onsite of over 60mph being recorded along with heavy rain. A high band antenna cover lifted off exposing 10 of the antenna cells to the wind and rain, damaging them. The low band antenna array fared much worse with 13 of the 96 damaged or destroyed (2 of them were blown away completely). Luckily, the design of the LOFAR means that it can still function even with missing antennae. Hopefully after some swift repairs the site will be back to normal and helping to investigate such puzzles as when did the first stars and galaxies form in the Universe as well as studying magnetic fields, cosmic rays and pulsars.